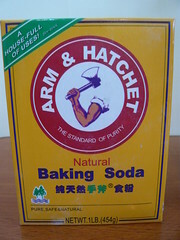 I love baking soda. It’s one of those things I can scarcely resist buying. Whenever I see a huge quantity of it for sale at the local warehouse store, I’m always tempted to pick up a big box of it, as you can get a twelve pound bag of baking soda for $5.76. Why? It has nearly infinite uses and is extremely inexpensive to acquire – the two elements of a purchase that make my frugal heart go pitter-patter. I originally started listing out dozens of specific uses of baking soda, but as I was doing research for this article, I came across a free book online that extolled the many frugal virtues of baking soda. It’s entitled Resourceful and Ingenious Uses of Baking Soda and the entire book is available for free at that link. Check it out! I thought I’d highlight twelve of my favorite uses for baking soda found in the above book, along with my own notes from using baking soda for that purpose. The book has many, many ideas I’ve never considered – looks like our big bag of baking soda is about to get used pretty heavily once again. Whenever something needs to be cleaned around the house, I just mix about four tablespoons of baking soda into a container of very hot water and mix it until it’s dissolved. The solution just cleans up almost everything quite nicely, from spots on the hardwood floor or linoleum to spots on the windows. If there seems to be any residue left behind, just wash it off again with a damp rag – just fine. If you have a casserole dish that has food that’s been caked on that’s almost impossible to remove, put some scalding water in the pan, then add about two tablespoons worth of baking soda and mix it into the water until dissolved. Let it sit for about an hour and the food comes off much easier. If that still doesn’t work, I like to clean out the pan again, then soak it in scalding water with about two bottle caps worth of vinegar for an hour, then dump that out and do the baking soda soak again. It’ll foam up some when you first put the baking soda into the water after the vinegar soak, but this makes all of the caked-on food practically fall off. Even at twenty nine years old, I regularly get oily skin, and I find that making a paste from roughly equal amounts of hot water and baking soda does a great job of taking care of the oil on my face. If you have a severe issue, you may want to talk to a dermatologist, but I’ve found it does a great job on the oily areas on my face. Halitosis can be a very disgusting thing. One sure way to combat the bad breath effects of halitosis is to brush your teeth with baking soda each day. Just keep a saucer with some baking soda on it near the sink, and when you go to brush, moisten your brush, dip it in the soda, and brush away. The taste is foul at first, but it does a very good job, and you can follow it with a good rinse and a brushing with normal toothpaste if you’d like a fresher taste in your mouth. Whenever the skin is stung or irritated, particularly when it’s itchy, just make a paste out of baking soda and water (roughly equal amounts of each) and spread it on the irritated area. This paste helps slow swelling from bee and wasp stings and takes the edge off of itchiness from other conditions. I do this all the time with mosquito bites and it really helps. Instead of turning to Pepto Bismol or Maalox when I’m feeling queasy, I just put a teaspoon of baking soda in a glass of warm water and drink it down. It really helps – it neutralizes stomach acid just as well as the other stuff (though the other stuff tastes better). Recently, we began to smell a faint odor from our garbage disposal, so we got out the old reliable baking soda and dumped some in there, about 1/4 cup, along with a couple squirts of dishwashing soap, followed by some warm water for a bit, then running the disposal with the warm water running. The odor went away immediately. I learned this from my great grandmother, who used to have a big wooden butcher block for a cutting board. After she was done with it, she would scrub it a bit with water, then sprinkle some baking soda all over the surface, then scrub it again. Her board always smelled fresh and clean – and she used it for cutting up everything under the sun. If you have a shirt with some sweat stains, just get the area of the stain wet, sprinkle some baking soda on it, and rub it into the stain. This gets rid of the sweat stain every time for me, even on white tee shirts. This is a trick an auto body restorer showed me once that the book repeated, and it works surprisingly well. If you have an item with light rust on it, just take a potato, peel the skin off it, dip the potato in baking soda, then rub the potato vigorously on the rust. Keep repeating it. Amazingly, the mix of the potato enzymes and the baking soda takes the rust right off! Afterwards, you may want to treat the item with rust protectant for long-term protection, though. When I was a kid, my shoes used to smell awful. My mom’s treatment for the problem worked like a charm, though. She’d just sprinkle some baking soda inside the shoes as soon as I removed them. It reduced the odor inside the house and wasn’t noticeable at all when wearing them. A few years ago, we owned two cats (both were given away to nice homes – an elderly couple and a family member – when cat allergies were discovered) and this is a trick we often used. Just sprinkle a few tablespoons’ worth of baking soda in with the cat litter and the odor absorption of the litter goes up tremendously, plus the soda absorbs some of the wetness, all without harming your cat a bit. Our cats seemed to like it just fine. The free book offers tons more tips for baking soda use, including one I’m anxious to try, but seems a bit dangerous. Considering the cost of baking soda (I can get it for far less than $0.50 a pound) and the diversity of use, I consider baking soda to be one of the best bargains out there.